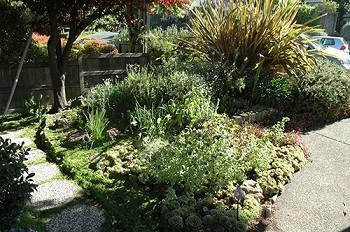 Marin Friendly Garden Walks is a partnership between Marin Master Gardeners and Marin Municipal Water District to provide homeowners in the MMWD service area with information and advice on improving their irrigation practices to help conserve Marin’s precious water resources. To make an appointment for a Garden Walk, call the Master Gardener Help Desk 473-4204, or fill out an online request for a Garden Walk. No landscape irrigation between the hours of 9:00 a.m. and 7:00 p.m.
Conservation is a way of life in California. Call the Master Gardener Help Desk at 473-4204, or fill out an online request for a Garden Walk. The UC Marin Master Gardeners Marin Friendly Garden Walkers were recognized at the MMWD Board of Directors meeting August 19th as Conservation Heroes” for their outstanding efforts in conserving water in Marin. Sharon Stender, Pam Polite Fisco, Susan Bloch, Peggy Mathers and David Lewis (UCCE Director) attended. 160 Master Gardeners have been trained by MMWD and MMG to conduct Garden Walks, a garden water usage audit. Garden Walkers have conducted 1600+ walks in the 10 years of the program resulting on a measurable 5-7% reduction the MMWD clients water usage. This program has won the Marin Conservation League Ted Wellman Water Award as well as recognition from the UC State Master Gardener organization. The Garden Walk program is expanding throughout the UC Master Gardener system and was the focus during the Statewide Conference recently. 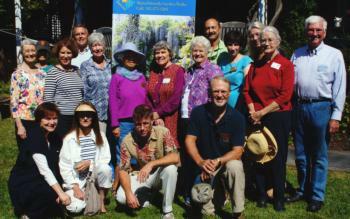 Garden Walks is celebrating its tenth successful year serving Marin residents. Trained by MMWD conservationists, two of the 160 trained Master Gardeners will visit your garden, suggesting irrigation improvements and plant selection, encouraging sustainable landscaping. Having visited 1700+ gardens throughout Marin, Marin Master Gardeners focus on the water, soil, and plant health of your garden. The program is promoted at Farmers Markets, public presentations at garden clubs, libraries, nurseries, the Marin County Fair, newspapers, radio, Patch and in MMWD water bills.